At nearly 113 m (370 ft) across and 37 m (121 ft) deep, Grand Prismatic Spring holds the title of the largest hot spring in America and one of the largest in the world. A premier attraction at Yellowstone National Park, the spring's fame traces back to early explorers and fur trappers who first noted it in the early 1800s. 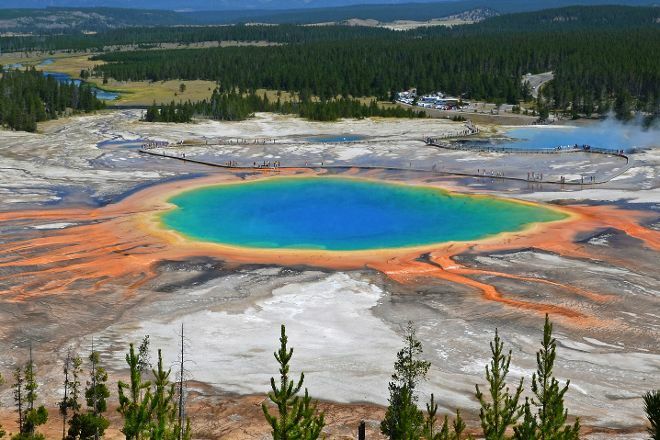 The boiling pool constantly steams and bubbles, with its vivid, rainbow-like appearance--the result of pigmented bacteria. To get a close-up view, walk along the park's boardwalk, which leads to a route close to the water's edge. Stay on the path, as the high temperatures of the pool can be dangerous. 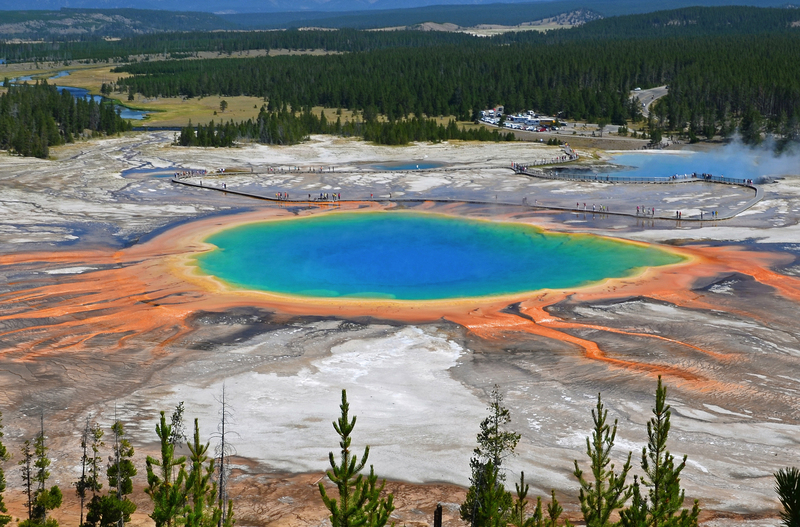 Plan to visit Grand Prismatic Spring and other customer-reviewed, writer-recommended Yellowstone National Park attractions using our Yellowstone National Park travel route app . Large Prismatic seen lower: slightly disappointed because vapors ruining the landscape, was not big thing (aside from the edges of the basin). To get + account, take the car park of the "fairy trail (a little lower - maybe 2 km to the old faithful on the right-)." Once parked you need to cross the bridge, then all right until the arrows on the left; We get in a small wood, then it's a small path on the right that leads to the point of view), finally the show is at the appointment you! One of the very unique places I have ever been.. so much colors and it's just a visual treat from nature. If you want a grander view, make sure you do the small hike (about 15 to 20 mins) from Fairy falls point.